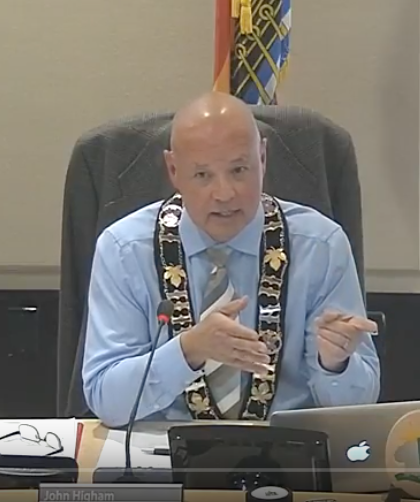 Mayor John Higham has rejected suggestions that Sackville Town Council did not fully understand what it was doing when it voted last year to continue the ban on more fast-food drive-thrus near the TransCanada Highway. The mayor was responding to a report that Sackville resident Sharon Hicks sent to the mayor and councillors last week. “I’m stymied with understanding how you’ve concluded that we’ve misinterpreted, we’ve misunderstood, we’ve miscommunicated and that we haven’t done anything,” Higham told Hicks after she presented a verbal summary of her report at Monday’s council meeting. Hicks also asked council to either lift the current ban or explain why it would not take a step that could encourage the establishment of new businesses in town. “We have consistently said, if there was a proposal, you could bring it forward,” Higham said. The mayor also rejected Hicks’s contention that the original 2001 bylaw banning further drive-thrus was meant to be only temporary. A majority of councillors voted against amending the bylaw during a council meeting in July 2016. At the time, some councillors feared that allowing a drive-thru at Exit 506 would open the way to more of them at Exit 504 leading to increased traffic congestion and pedestrian safety concerns near the high school. At this week’s council meeting, the mayor suggested similar concerns arose as councillors considered the prospect of a drive-thru at Exit 506. “When we started to examine it, what we were seeing were eerie similarities between what had happened in 504,” Higham said, “how the roads were misaligned, where there was no left turn lanes, roads that come in on an angle, bends without any pedestrian crossings, that there was a lot of questions about how this could develop properly,” he added. So, he said, council decided to commission a study to determine what would be needed to accommodate business development at Exit 506. “You’re urging us to act before we get that information,” the mayor told Hicks. “You’re urging us to act without any understanding of what the public investment would be,” he said, adding that public money had to be spent at Exit 504 to fix problems that the drive-thrus there caused. After the mayor spoke, other councillors echoed his concerns about allowing more drive-thrus without further study although it’s clear that Bill Evans and Megan Mitton also oppose them on environmental grounds. Allison Butcher and Michael Tower said they would definitely not want more than two drive-thrus at Exit 504, but suggested they could be open to them at the less-congested 506. C0uncillors Bruce Phinney and Joyce O’Neill called once again for lifting the ban on further drive-thrus, especially at Exit 506. For her part, Sharon Hicks said that if council lifted the ban, it could prevent drive-thrus from springing up everywhere by imposing strict conditions that would prevent traffic congestion and alleviate safety concerns. The comments about traffic drive-thrus came at the beginning of Monday’s council meeting. To see and hear everything that happened in those opening 22 minutes, click here. This entry was posted in Town of Sackville and tagged drive-thrus, Mayor John Higham, Sharon Hicks. Bookmark the permalink. It is very, very discouraging for anyone trying to bring a bit of much needed economic development into our Town. I really cannot understand the Mayor and Council and it makes one wonder what their real agenda is. As stated above, Sackville is the only municipality in all of Canada that has a total BAN on drive thrus and the accompanying businesses. The BAN has been in effect for 16 years. Wonder where the Mayor is getting his information from 2001 and that the ban was not to be temporary. He wasn’t there I was a member of council in 2001. The concern was congestion from what I recall due to poor planning by the planning commission and town staff (engineer of the day back when the area was developed). So technically the problems that came to be were due to the municipality itself and to solve the issue a stop on drive-thru’s was suggested by planning staff until it could get sorted out. There was talk of starting to realigning Mallard and Wright St however it involved negotiations with property owners such as McDonalds and was not well received. We have a Mayor who appears confrontational and who seems to be supportive of the bureaucracy that exists in town and the bureaucrats rather then the people he is suppose to be representing. That is not surprising though seeing how his consulting firm only does work with public sector entities. Maybe he should try the private sector sometime and see what it is like. There needs to be a balance between public sector and private sector approaches when conducting Town business. I feel the urge to reply as I live near Exit 506. Thank you Ms. Hicks for your excellent report (it makes sense and I learned a lot from it). It is refreshing to read that most of the Councillors cited in this article have common sense. Mayor Higham, you wrote: “We have consistently said, if there was a proposal, you could bring it forward”. Interesting as there is a clear wise proposal at the end of the article: Ms. Sharon Hicks’ proposes to lift the ban as “it could prevent drive-thrus from springing up everywhere by imposing strict conditions that would prevent traffic congestion and alleviate safety concerns“. In other terms, Sackville citizens are asking their politicians to solve the sad ban saga by coming up with a (clever!) policy around Sackville’s conditions for drive-thrus (an environmentally friendly policy whilst having an economic vision for our town). I guess the real question is: Do our public officials want to finally listen to the voices of Sackville citizens (through their great Ambassador, Ms. Hicks)? If so, what are the next steps on the agenda? They would really blow their minds if they were here in St. Stephen, there are not 1 but 2drive-thrus in the same building the new Irving. And guess not a word said from council. I’m supportive of a “greener” community but we can’t hang our hopes on “unicorn farms” and “pet rock factories”. In fact hope is not actually a plan. We have to support existing businesses in town while developing a PLAN to entice more businesses to locate here. That involves boots on the ground, knocking on doors and having face to face discussions with potential businesses to relocate or branch out here. This is a great community to live in, education from K to University and a nice sprinkling of shops, galleries, parks, restaurants and so on. Let’s further develop the economy, create good job opportunities and hence strengthen the community. Town staff are there to serve Council (and the public) and Council is there to serve and represent the community interests (not to bow to the will of senior staff). Chart a course, throw off the bow lines and head into the wind. Nothing ventured, nothing will be gained. Well said Castironcamper. We need to get your name on the ballet next election. There is more to Governing Council than simply microaggressions and identity politics, especially at the municipal level. Also with these matters, the Town of Sackville really has no jurisdiction anyway. I suggest that this Council/Chief Administrative Officer (CAO) etc… spend more time on doing things like reading the Municipality Act NB and Roberts Rule’s and understanding it. I know it is boring and hard but it is kind of important. You know who is against the Planet no one. The Town of Sackville is by no means the only folks or level of Government guilty of doing this. For example, I have seen this done on several occasions with committees for the Town of Sackville, saying we can’t discuss this matter because we don’t have a quorum then go on and discuss other matters you can’t do this it is like Rule Number One e.g. Robert’s Rule. I personally applaud the Sackville Town Council for upholding values related to a healthy lifestyle and a healthy environment. I chose to live in Sackville because it is a beautiful small town with a good quality of life. Our society is becoming more and more unhealthy as people choose convenience above all else. Drive-thrus promote pollution, waste and sedentary lifestyles. The alternative, requiring that people exit their vehicle, is not a hard sell and encourages movement and socialization, two things that are becoming less commonplace. People argue that Council is against economic development by not voting in favour of this project. I personally think that Sackville residents would be better off if more forward-thinking, creative ideas (instead of more fast food and drive-thrus) were put forth. If looking for something that would appeal to highway drivers, perhaps consider what isn’t already available and many people would be interested in, like healthier food options and a pleasant setting to stretch your legs and have your children play. Good job, Sackville Town Council. We love visiting your town and spend a fair bit of money while out walking around. Good for you/Bravo for your healthy lifestyle and green values! This is still not the reality of everyone in the area to the point that excellent ethnic restaurants in nearby towns had to close. One can only wonder whether people’s attachment to their “unhealthy” food has played a factor in such failed businesses. Sometimes people eat healthy at home. Thus, at times, they feel like appreciating a less healthy food choice when going out (e.g, they chose an appealing Hawaiian pizza over a healthier yet succulent Mediterranean meal, this even when they may be of Lebanese origins themselves. Shame :)!). Anyhow, drive thrus remain convenient to diverse people for diverse reasons. Who knows? Perhaps to a tourist bus driver who is eager to continue his/her drive and go home to sleep? Or maybe to a single mom or dad with a sleeping infant? Or to a family with a child with a complex health condition who may just have had another seizure, perhaps on the road toward a children’s hospital in a nearby province? Of course, some other people may be leading unhealthy lifestyles or…they happen to be acting lazy on a single day (not wanting to walk or talk). The bottom line is that these people should not feel unwelcome because of their wishes. In addition, I think that the reality is not black and white. There are always shades… Drive thrus may also offer healthy food such as “Salad and Go” elsewhere. Plus, we can also imagine that in a few years, more and more cars will be E-vehicles. To conclude, I hope our political officials are as genuine as you assume they are… I also wish they really know what they are doing. Jane – as Rima has mentioned, there are many people in our world today who, for one reason or another, do not have an easy time in “parking your vehicle and walking inside” to get their food or beverage at a restaurant. People with disabilities in particular often benefit from the availability of drive-thrus, especially if they are pressed for time and just need to pick up a quick coffee or snack. The time it would take them to park their vehicle, transfer into a wheelchair or scooter, make their way into the restaurant and back out again, transfer back into their vehicle and then store their mobility device, often means they are excluded from something the rest of us take for granted every day. Inclement weather also causes problems for many people, such as the elderly, or parents with small children, where it could actually be unsafe for them to be walking on slippery surfaces to get into and back out of a restaurant. The list goes on. Long story short, while in an “ideal world” everyone would have the time AND the ability to defer to such “healthier” choices – ie: parking their vehicle and walking to the restaurant – this option is not readily available to everyone in our society. To disallow drive-thrus, in this day and age, is literally the same as excluding certain sectors of our population. For a town which says it is trying to promote INCLUSION of everyone, regardless of age or ability, should they not be encouraging something which would be of definite benefit to those persons.